The alarm goes off. You reach over to turn it off. You linger in bed a few moments longer, filled with dread for what awaits you this morning. No. Not that pointless meeting at work, or even the traffic you’re going to battle to get there on time. Those are nothing compared to the stabbing pain on the bottom of your feet that greets you every morning when you take those first few steps to get the day started. If this sounds painfully familiar, you may have plantar fasciitis. In fact, plantar fasciitis is one of the most common causes for heel and foot pain among active individuals. To help you understand what causes plantar fasciitis and how you can treat it, let’s first review the basic anatomy of the foot. The plantar surface of the foot is made up of four layers of muscles, which are supported by the plantar fascia, a thick band of connective tissue. Under normal conditions, the fascia in the bottom of the foot acts as a shock absorber, stretching and supporting the arch as the body loads the foot in walking and other weight bearing activities. The root cause of plantar fasciitis is often debated in the rehab community, but it is commonly believed to be repeated microtrauma to the plantar fascia. This painful condition accounts for up to 15 percent of all foot injuries treated by physicians and rehabilitation providers. Localized pain in the heel is the most common symptom, but you may also feel soreness down the arch and into the toes. Age – plantar fasciitis is most common between 40-60 years of age. Type of activity – exercises that place a great deal of stress on the bottom of the foot (such as running and dancing) may contribute to onset of heel pain. Foot mechanics – having flat feet or very high arches can change the mechanical loading patterns of the foot. Obesity – excess weight places excess stress on the tissues. Occupations that require standing for long periods of time. Going barefoot (or wearing minimalist shoes) without allowing proper time for the tissues to adapt to the lack of cushioning and heel rise found in most shoes. Pain and tenderness on the bottom of the foot at the heel. Significant pain when first putting the foot on the floor in the morning. This is the most common complaint from patients that I treat with this condition. Pain in the arch or the base of the toes (less common). Less commonly, patients complain of burning or numbness in the arch or bottom of the foot. This may be indicative of medial plantar nerve entrapment, which will not be discussed in this article. Diagnosis of plantar fasciitis is typically made by taking a complete history of the patient’s complaints and performing a clinical examination. In the past, it was very common for physicians to order X-Rays of the bottom of the foot. Sometimes X-Rays reveal a heel spur, which was thought to be the cause of the pain in the past. Recent literature does not support this theory, as many people have a bone spur on an X-Ray, and have no complaints of pain. Your physical therapist will evaluate your foot with you standing up, to see how your ankle and foot look in a weight-bearing position. They will then examine your foot in a non-weight-bearing position, take measurements of ankle range of motion, and test lower extremity muscle strength. Additionally, your physical therapist may utilize video gait analysis to watch you walk and run on a treadmill, which can provide useful information about your running mechanics and foot and ankle position. The results from these evaluative measures will assist your provider in determining a course of action for treatment. Rest from aggravating activities such as running, walking, and standing. Use of a shoe insert (orthotic) or heel cup to support your arch and cushion the heel. 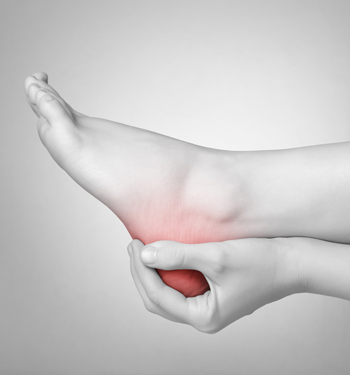 Current research shows that orthotics are beneficial for short term pain relief. Use of a night splint to keep the foot and ankle in a neutral position overnight. Use of a night splint has been shown in recent literature to assist in decreasing pain and aiding recovery. Avoiding going barefoot, even in the house. Use of ice to decrease pain (some people like to freeze a water bottle and roll the foot on the frozen bottle). Exercises to stretch the calf and foot. Strengthening and stretching exercises for the muscles in the lower leg and foot. With proper treatment, most cases of plantar fasciitis are resolved in six to eight weeks. You should return to activity progressively, assessment of your body’s response as you gradually increase activity. It is important to continue your stretching and strengthening exercises during this time. We strongly recommend including injury prevention strategies in your training program to address mobility, stability, and overall movement. Dealing with an injury or chronic pain can be frustrating and scary. You feel helpless and out of control, and just want your body to function like it used to. What’s the point of going to the gym if I’m in pain afterward? I can’t work out as hard as I want to, so why work out at all? For many people, it’s enough to make them want to throw in the towel completely. At Paragon we want you to enjoy an active lifestyle, and we want training to be a meaningful part of your life—and staying healthy is key. While it's impossible to prevent injury completely, there are things you can do to reduce your injury risk.